This is the fourth and final part of our series of guest blogs by Fatimah Araneta. Fatimah Araneta grew up in Mexico City. After gaining a Masters in City Planning at Berkeley, California, she opted to eschew city life and direct her energy and attention to living in tune with what’s left of Mother Earth before it all gets paved over and criss-crossed with cabled and non-cabled networks. She lives “off the grid” in the shadow of the volcano she prefers to call Chicnautécatl. Finally, we come to what León-Portilla calls the fourth layer in a place name: the part applied during Mexico’s independent era. The purpose usually was to deliberately erase names that were too Castilian for the newly-born nation’s taste, as in the case of the state of Jalisco, which used to be Nueva Galicia, or Tamaulipas, which was formerly called Nuevo Santander. Both Jalisco and Tamaulipas are prehispanic names. Sometimes the new place name was to honor a war hero. Today’s Ciudad Hidalgo used to be Tajimaroa; Ciudad Juárez’s old name was El Paso del Norte (today the city to the north of the border from Ciudad Juárez retains part of that name: El Paso, Texas). And coming back to the domains of the Nevado/Xinantécatl/Chicnautécatl, there is a small city about an hour’s drive to the west of the volcano with a place name history of its own. Nine hundred years ago it was a densely populated area, the focus of pilgrimages and of commerce, a place where produce, goods, news and ceremonies were exchanged between the people of the altiplano (the higher, cooler plains) and those of tierra caliente (the warmer lowlands). The Nahuatl name for it was Temascaltepec, “Place of the Hot Vapor Baths”. 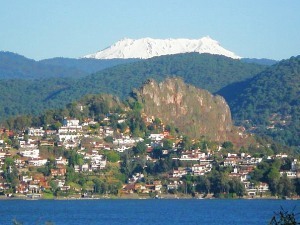 Valle de Bravo. Photo: Fatimah Araneta. All rights reserved. Since it was contained in an ample valley, the Spaniards began to call it Valle de Temascaltepec. During the war for independence, the hero Nicolás Bravo and his army passed nearby, on their way from Chilpancingo to what is the state of Morelos today. Admittedly, none of them actually spent not even a night in Valle de Temascaltepec, but the proximity of their famously brave passage was enough for the the town to decide one day to drop the Temascaltepec and change its name to Valle de Bravo. In view of all this one can only conclude that there is a great deal in a name, especially in a place name in Mexico, and that to wholly or partially modify a place name is to risk losing an important part of the memory of its past. This concludes our mini-series on Mexican place names. GARCÍA MARTÍNEZ, Bernardo, Los Nombres del Nevado de Toluca, in Arqueología Mexicana, Vol.VIII, no.43, pp.24-26, May-June 2000. LEÓN-PORTILLA, Miguel, Toponimia e Identidad, in Arqueología Mexicana, Vol.XVII, no.100, pp. 28-33, November-December 2009. SIERRA CARRILLO, Dora, San Miguel Arcángel en los Rituales Agrícolas, in Arqueología Mexicana, Vol.XII, no.68, pp74-79, July-August 2004. The dropped name was quickly claimed by a neighboring town, Real de Abajo, “Lower Mine”. It is one of twin towns located in an area of silver and gold mines (reales, in Spanish). The other town is called Real de Arriba, and still conserves that name. Real de Abajo must have felt uncomfortable all its life with its lowlier designation and quickly adopted the more elegant Temascaltepec to make up for its previous existence in the shadow of the “Upper Mine”. Click on the word “placenames” or the “placenames” tag for more articles about Mexico’s place names.